 The present study is intended to critically examine metadiscourse markers in 24 master thesis abstracts. Twelve of them are written by non-native Iraqi female students and the rest by native American female students. To do so, the researchers have set two aims: examining the types and subtypes of metadiscourse markers in terms of nativity and major and comparing the usages of metadiscourse markers’ types and subtypes in terms of nativity. To achieve the present aims, Hyland’s model (2005) is adopted. It aids in classifying the types and subtypes of metadiscourse markers in both data. 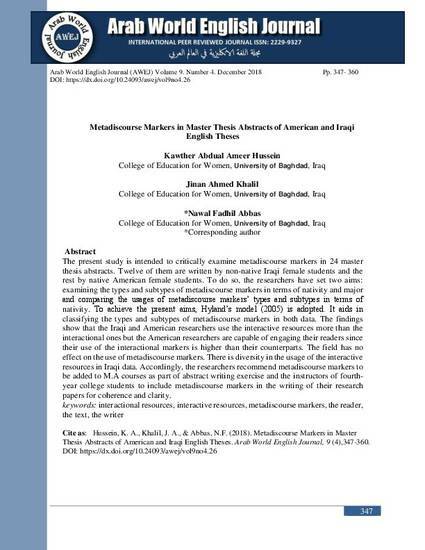 The findings show that the Iraqi and American researchers use the interactive resources more than the interactional ones but the American researchers are capable of engaging their readers since their use of the interactional markers is higher than their counterparts. The field has no effect on the use of metadiscourse markers. There is diversity in the usage of the interactive resources in Iraqi data. Accordingly, the researchers recommend metadiscourse markers to be added to M.A courses as part of abstract writing exercise and the instructors of fourth-year college students to include metadiscourse markers in the writing of their research papers for coherence and clarity.